SPANTAX Douglas DC-3A-197, EC-AXS, C/N 1984, built 1937 as Douglas DST A-SCG for United NC18112, ex N18112, 5T-CAC, with SPANTAX as EC-AXS from 1964 to 1977, after registration N99210, C9-ATG and last ZS-BAA in South Africa. SPANTAX (Spanish Air Tax Lineas Aereas S.A.) was founded 06-10-59 by Rudolf Bay Wright and his early fleet was built with nine DC3's. Three were lost in accidents. Original by John Kelly. Repaint and flight model by Daniel Nole. 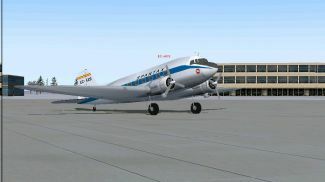 Screenshot of SPANTAX Douglas DC-3A-197 on the ground. description=SPANTAX Douglas DC-3A-197 EC-AXS,C/N 1984,built in 1937 as model Douglas DST A-SCG for United NC18112, ex N18112, 5T-CAC, with SPANTAX as EC-AXS from 1964 to 1977,after reg. N99210, C9-ATG and last ZS-BAA in South Africa. SPANTAX(Spanish Air Tax Lineas Aereas S.A.)was founded the 06-10-59 by Rudolf Bay Wright and his early fleet was built with nine DC-3(two ex Swissair,one Sabena, six USA).Three were lost in accidents(EC-ARZ, EC-ACX, EC-AQE).Original by John Kelly,Repainted and Flight dynamics by Daniel Nole. The archive dc3ecaxs.zip has 27 files and directories contained within it.